Lately, #1 and I have decreased the gluten in our diet. It makes me feel better. I think he is still not sure, but he is going with it. 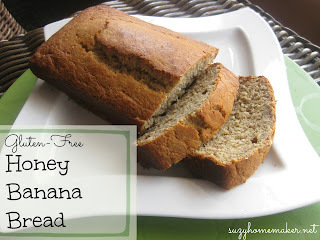 So in the interest of going gluten-free and wanting to use up some bananas, I decided to try a gluten-free banana bread. I used Bob's Red Mill Gluten-Free All-Purpose Flour . They have a recipe on their website, however I did change a few ingredients. * I used a pumpkin spice mix instead of just cinnamon; just cinnamon might be better. I followed the directions from Bob's Red Mill Site exactly, so I am not going to retype them here. The only thing is that I did cook the bread for only 45 minutes instead of the recommended 1 hour. Because I used honey instead of sugar, I should have probably decreased it even more. It came out slightly dry. And in the interest of full disclosure, mine did not come out of the pan perfectly.